McALLEN — Cheers and applause rang out over the weekend as over 6,000 students around the Valley received degrees during Spring commencement exercises at South Texas College and the University of Texas Rio Grande Valley. 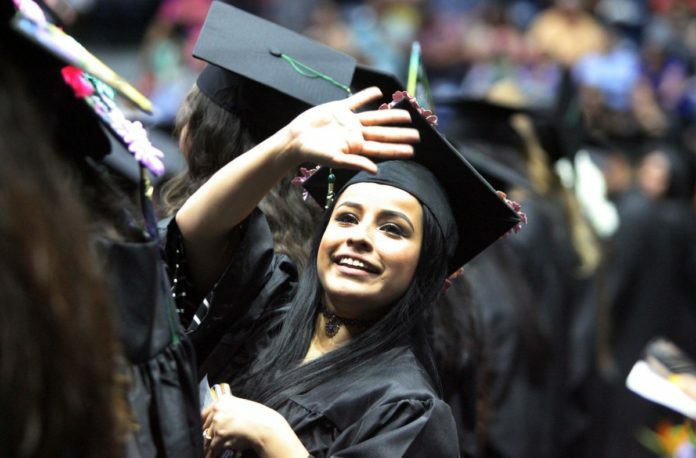 South Texas College held its graduation ceremony on Friday and Saturday with approximately 3,000 degrees being awarded at State Farm Arena in Hidalgo. In addition, STC saw it’s largest graduating class of dual credit students in its history. Nearly 800 dual credit students graduated with degrees in liberal arts from STC on Friday. UTRGV also held their ceremonies on the same days. The Lower Valley campus ceremony was held Friday in Brownsville and the Upper Valley ceremony was held on Saturday at the McAllen Convention Center with more than 3,100 degrees conferred between the two campuses. Students from both institutions, dressed in their caps and gowns, sat in anticipation waiting to receive their diplomas and for the moment when they could move their tassel from the right to the left to signify their achievement. Dominic Garcia, of McAllen, graduated from South Texas College with an associate degree in American Sign Language – Deaf Support Specialist and had his parents and friends with him to celebrate this occasion. “I feel relieved and excited for the next step in life — getting a job.” Garcia said. Another graduate, Wanda Hernandez of Mission, received her associate degree in criminal justice which she hopes will be a role-model and motivator to her son, who she hopes will follow her footsteps in receiving an education. “I feel happy and the first girl to graduate in my family.” Hernandez said. Some students marked their achievement by decorating their cap in lettering and glitter, such as a UTRGV student cap that read “Class of 2017.” The audiences in both locations were filled with family members holding balloons and flowers waiting to give to their graduates. Ricardo Briones, of Mercedes, graduated from UTRGV with a bachelor’s in business management and celebrated his achievement with his parents and other family members. Another UTRGV graduate was Jeanette Hinojosa, of Elsa, who received her bachelor’s degree in interdisciplinary studies and plans to start teaching. “I feel super excited, all the stress, all the crying, it has finally paid off.” Hinojosa said. STC awarded 147 Bachelor’s degrees, 2,292 Associate degrees, and 1,117 Certificates during its four commencement ceremonies. The college is one of the only two-year institutions in the nation to offer bachelor’s degrees to students. TRGV President Guy Bailey congratulated the Class of 2017 for their accomplishments and told them that this day was the beginning of the rest of their lives. “Remember as you leave today that this is the beginning, not the end. This is commencement, not termination … We are very proud of you and we look forward to following you the rest of your lives,” Bailey said. He also told the graduates to celebrate their achievements. “You have achieved something very special,” he said. “We have great ambitions for you. We want you to get out and get really good jobs. “Now, I have to warn you that after you make your first million, I’m going to come and ask you for part of it,” he quipped.